You love your patio and want to upgrade it. No matter what your family’s needs are, Premier can customize your patio screen enclosure to fit them. You will have choices of a variety of screen fabrics and framings. We specialize in creating custom designs for extraordinary patio enclosures, and we conduct every project we undertake with exceptional care. Patio screens will enhance your outdoor pleasure and serve a twofold function. 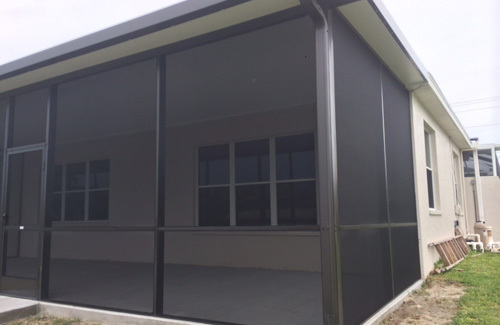 First of all, patio screen enclosures provide superior protection against the mosquitoes and no-see-ums through use of the best screen fabrics that are available on the market. Secondly, screening your patio will keep your patio much cleaner. An enclosed patio can increase your livable space while screening moisture. We’ll make sure the patio enclosure provides a perfect bridge between your home’s current architecture and the outdoor environment. We want you involved throughout the process, and we make sure that you are getting precisely the services you need from our team. We use outstanding workmanship to create lasting beauty and functionality in your home. You’ll enjoy it for years to come!